Union and Confederate guns fell silent in April 1865, but the civilian population was slow to give up certain behavior acquired during the four years of bloody civil war. No one in the North felt especially charitable toward the South, and few seriously considered rebuilding what industry had existed there before the outbreak of hostilities in 1861. Specie payments had been suspended by the government in 1862 and peace had not seen the return of silver or gold coins to circulation. Citizens continued to hoard all forms of coinage that contained precious metal, and even copper-nickel cents were set aside for their limited intrinsic value. 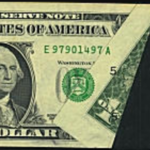 During the war the federal government issued series after series of fractional currency. These “shinplasters” as they were known, rapidly soiled in circulation and were despised by the public. When yet another five-cent issue of fractional currency was introduced in 1865, it was enough to push Mint Director James Pollock to endorse a five-cent coin made of nickel. Pollock had previously been an opponent of nickel coinage. He saw first hand how difficult 12% nickel coins (the 1857-64 cents) were to strike and how the hard, brittle metal broke dies and injured the Mint’s machinery. He also knew how politically persuasive one Joseph Wharton was in the halls of Congress. Wharton owned the largest nickel mine in America and had lobbied Congress for many years to use the metal in the nation’s coinage. But after the third issue of five-cent fractional currency was released to unfavorable public opinion, Pollock was finally convinced that the nation’s best interests would be served by striking a new five-cent coin in nickel, even if it meant adding to the already wide assortment of small denomination coins then in use. 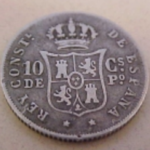 These included the half cent, large cent, copper-nickel cent, two-cent piece, three-cent nickel, three-cent silver and silver half-dime. Most of these coins were not circulating due to wartime hoarding. Pollock looked at the nickel five-cent piece as a temporary measurea coin that would circulate and replace the universally unpopular fractional notes until such a time as the silver half-dime could return to circulation. As Chief Engraver it fell to James Longacre to design the new coin. Various patterns were executed, the most interesting ones featuring profiles of Washington or Lincoln, but the issue of portraying actual persons on coinage was far from resolved. In fact it was a particularly sensitive subject as the five-cent fractional currency the new coins would replace depicted the likeness of Spencer M. Clark, then head of the Currency Bureau, not the explorer William Clark as Congress had been led to believe. 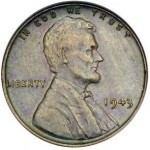 Unable to use a portrait, Longacre merely modified the motif he used two years earlier on the two-cent piece. Although the adopted design does have a certain geometric balance, it is artistically weak. Even nickel monopolist Joseph Wharton, the man who stood to make more money than anyone else from the new coin, was disappointed. He described the coin as having ” . . . a tombstone surmounted by a cross overhung by weeping willows.” The design was actually a shield with the cross of the Order of Calatrava at the top, flanked by a wreath on both sides. The reverse, while simply designed, was initially controversial. The central device shows a large numeral 5 and is surrounded by thirteen stars with thirteen sets of rays between the stars. 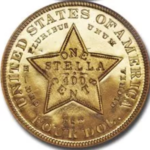 At the time of issue, some believed Southern sympathizers had infiltrated the Mint and placed the Confederate “Stars and Bars” on the reverse. The new coins seldom struck up well and more dies were broken striking Shield nickels than all other denominations added together. 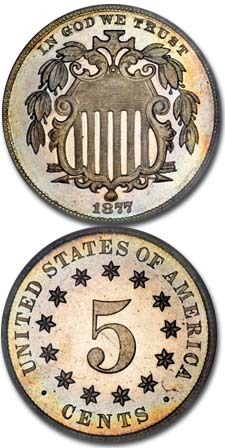 During the first two years of issue the rays were retained on the reverse, but early in 1867 they were eliminated as Mint officials believed this design element prevented the coins from striking up completely. As originally proposed, the nickel five-cent piece was to weigh not more than 60 grains (or 3.88 grams expressed metrically) and be composed of 75% copper and 25% nickel. The House Coinage Committee intended for the new coin’s weight to be expressed in metric units, but could not bring itself to publicly state so. The next metric weight would have been four grams, but this unit was mysteriously bypassed and five grams was the weight adopted. But rather than express the weight in this simple term, the enabling legislation required the coin weigh 77.16 grains, the English equivalent of five grams. Shield nickels were only struck in the Philadelphia Mint, and more than 126 million were produced from 1866 until the next design change in 1883. For such a short-lived series there are a surprising number of rarities. The two key issues are from 1877 and 1878 when only proofs were struck. Among business strikes, the years 1879-1881 are low mintage dates and worth large premiums in all grades. There are two overdates, the 1879/8an overdated proofand the 1883/2. Proofs were struck every year and include one of the most important 19th century raritiesthe proof 1867 nickel with rays. Only 25 pieces are believed to have been struck. Counterfeits are plentiful bearing the dates 1870-76, and they were widely circulated in the New York-New Jersey area during the 1870s. They are not deceptive, however, as the design differs slightly from genuine coins. Striking details are often ill-defined on Shield nickels, and high grade coins that are weakly struck must be graded by the amount of mint luster still remaining. The points to first show wear are the cross and leaves on the obverse and the numeral 5 on the reverse. In 1883 the Shield nickel was dropped in favor of Charles Barber’s new Greco-Roman headed Liberty nickel. 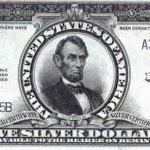 The Shield nickel, though, was the first nickel five-cent piece, and while the design has changed several times since 1866, the basic 5 gram “nickel” has remained a mainstay of our modern coinage system. How do I get started in coin collecting? What’s the name of the former British coin called a “thick penny”?